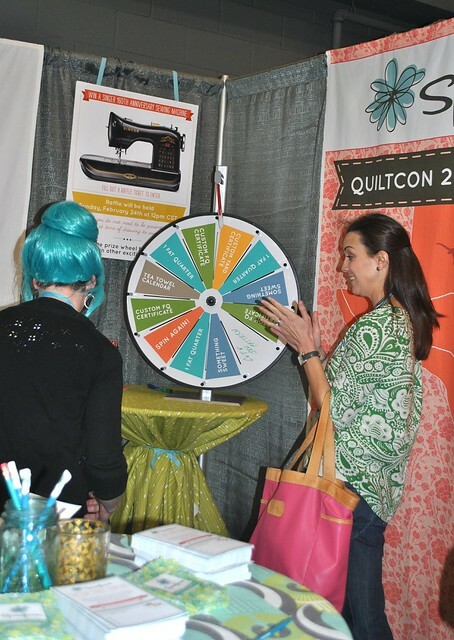 QuiltCon Recap: The Booths + Giveaway! 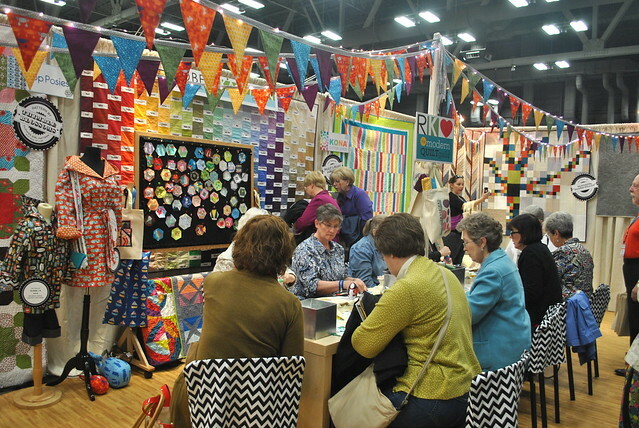 At QuiltCon last weekend, anyone could come and peruse the quilt show and vendor booths for just $10 per day, whether or not they bought admission to the lecture hall or any special sewing workshops. I bought a two-day lecture pass ($180 for Friday/Saturday), which included admission to the show. If I had it to back and do over again, I would have loved to also take some workshops with Jay McCaroll, Denyse Schmidt, Lotta Jansdotter and others! I heard great recommendations from friends who took the workshops offered. There were also some pretty serious swag bags handed out to registrants that paid $399 or more for their show passes (which typically meant signing up for a workshop at $150 for a full day or $75 for a half day). Back to the show and vendor area . . . 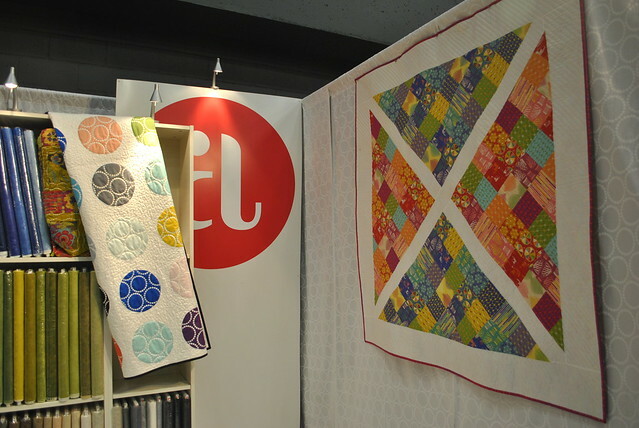 The Michael Miller booth featured a quilt by my friend Amy from the Indy Modern Quilt Guild. It's the pretty diamonds quilt in the center/back wall of the booth. So happy for you, Amy! They were also giving out snacks, which is pretty cool. The Robert Kaufman booth was really colorful and they had a make-and-take going on where you could create a free tote bag with precuts. I didn't end up making one, but as you can see, it was a pretty popular area! 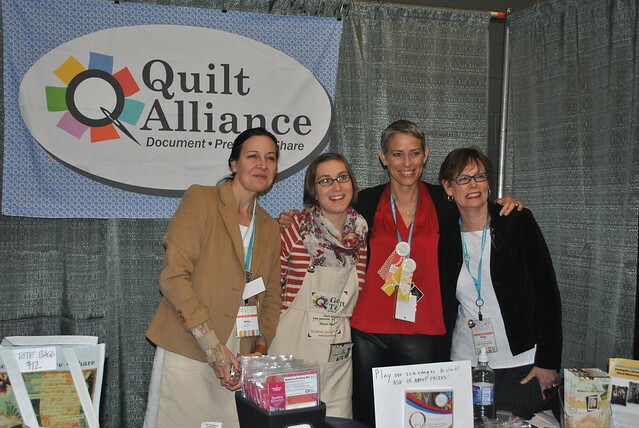 Here are the ladies from the Quilt Alliance booth, along with Best in Show winner Victoria Findlay Wolfe (third quilter). Not only did it feature blue hair, but the Spoonflower booth was super fun with a prize wheel where you could win anything from a custom-printed yard of fabric to "something sweet" (a piece of candy). I won a little assemble-your-own robot doll. The Stash Books booth featured these "Pillow Pop" pillows, as well as author signings all weekend long! I was really happy to meet Elizabeth Hartman and Alissa Haight Carlton, among others, who were running around all weekend attending to the details to put this show and conference together. I told them I was super impressed with how organized everything was in the event's first year. It was really well done! 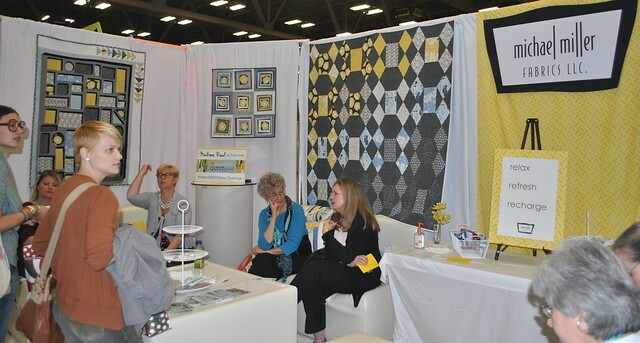 The American Patchwork & Quilting booth featured a sew along for the local Austin children's shelters. I made this pillowcase, which was seriously so easy and took all of 15 minutes from start to finish using their clever "roll up" method. 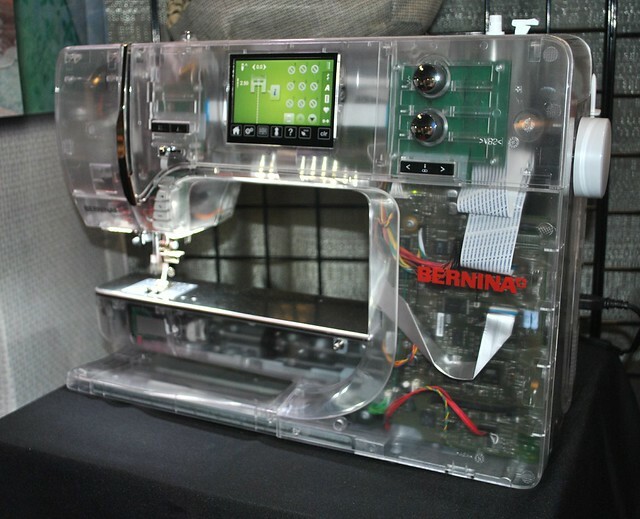 I talked to Bernina about their newest models, and was super in awe of this see-through version. I guess it's true that quilting is both an art and a science. Overall, I'd have to say that the Andover Fabrics booth was "where it's at." See that table filled with charm packs? If you signed up for their e-mail list, they were giving away freebies all weekend until they ran out. Here's another shot of the Andover booth. It was right next to a live demo area, where I saw . . .
. . . Heather Ross doing a demonstration of her fabric-covered journals. The crowd was standing-room only, and I also got to hear some of Heather's lecture the day I arrived. 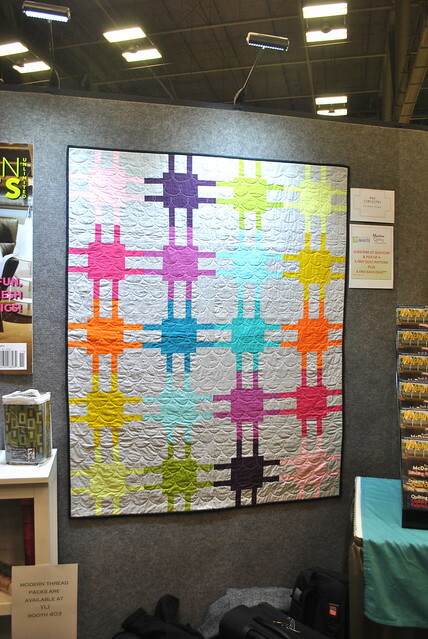 The Modern Quilts Unlimited booth featured this pretty pop of color from Elizabeth, which will be published in their magazine soon. Isn't it drool-worthy? 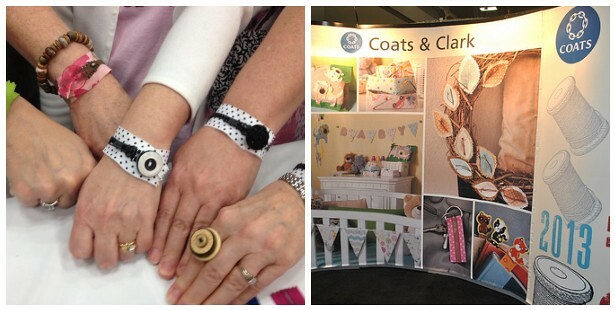 The very first booth I stopped at was Coats and Clark, where they were making zipper cuffs as a make-and-take. I had fun chatting with the fabulous Lynn and checking out their new product, called Phoomp (see below), which is an adhesive surface you can stick to fabric to make dimensional projects like flowers and embellishments. I can't wait to try it out! Catch up on parts 1 and 2 of my QuiltCon recap, all about the QuiltCon quilts and the people I met. Looks like a great time, Lindsay. I'm working on assembling my block of the month quilt (I may be soliciting advice for the quilting, so get ready!). I'm stitching a binding to finish quilt. Thanks Lindsay! I was going to go and then had to cancel at the last minute. Nice to see the recaps! Thanks for sharing so much great information about Quilcon. Oops sorry did not answer your question- I am working on scrappy trip and the something new sampler, trying to spark my sewing mojo. Trying to finish my Starburst quilt along and pulled wool fabric to get started on some Easter fun. I am working on my first Civil War quilt and loving it! I have a bunch of stuff on my kitchen (aka craft table) including 4 quilts. maybe I should finish something rather than starting something new! and waiting for their Mystery Quilt to come out on March 1st. Love these Girls style. Im working on 2 birthday buntings for the girls! I'm working on outfits for my kids to wear to a Hawaiian wedding. A purple Hawaiian dress for my 4 year old and a cheesy dolphin Hawaiian shirt and white linen pants for my 2 year old. So much fun to make!! so fun! I'm working on a foot rest for my little reading/handsewing corner! I'm still working on my Swoon quilt (4 blocks down 5 to go) and about to finally fnally bind my "Christmas Tree Pants" from the Sew Mama Sew sewalong 2011. QuiltCon looks like it was a lot of fun. I've got a couple of things I'm working on right now. First the Scrappy Trip Around and a few paper pieced blocks. Liking how both are turning out! Thanks for the giveaway ~ so generous. I'm trying to finish a quilt, I'm almost there! Working on the BOM for my Modern Quilt Guild. I'm making some Keyka Lou 'pleated pouches'! Sounds like you had a great time! I've just finished the Starburst QAL and even though building work has just started on our house I've cut out everything for the Orbit QAL; I need something to keep me sane! I'm currently working on the lining for my weekender bag! Making burp clothes and bibs for my daughter's teacher, who is expecting her first child. 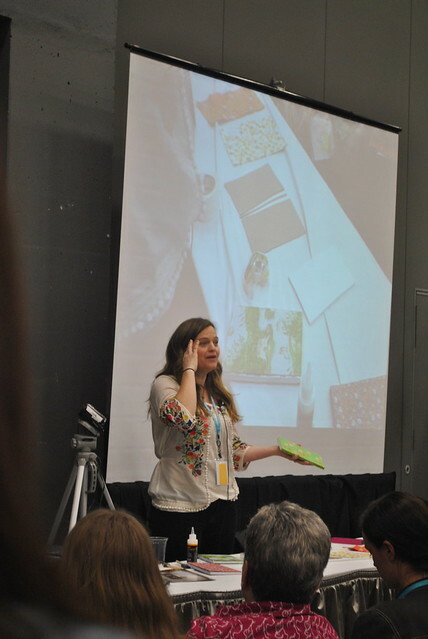 Loved the recap of Quiltcon, Thanks! I'm working on an Easter dress for my daughter, sewing hexies for some future project and designing my new office. Busy busy busy! Cool pictures! I like Elisabeth's quilt! Amazing! I'm working on a white and gray gingham quilt for myself. I'm very jealous of everyone that got to go to QuiltCon. Sounds and looks like it was a blast! I am making a quilt for my husband to give to a friend of his who is recently back from a tour of duty in Afghanistan, and brought my husband an American flag that flew over Afghanistan. This friend gave us a treasured keepsake so we're hoping that a quilt is a worthy gesture of thanks. I am working on my future Daughter-In-Law's wedding dress, my new Granddaughter's Blessing Dress, the Women of Courage Block of the Month, a portrait challenge from my quilt group, another Granddaughter's "Princess Quilt".... and not getting very far on any of it as long as I am looking at all the pretty pictures from QuiltCon! My first quilting attempt - a table runner - is what I'm working on right now. I'm always working on random blocks, but my main project lately is organizing my yarn stash. I'm collecting ideas since it is the end of the trimester and all my grading is due. Ah, the perils of grading in the same place I sew! I'm working on iPad case for a friend (using your tutorial on craftbuds) and a baby quilt for a friend's new son. Thanks! QuiltCon sounds awesome. Right now I'm making an overnight bag out of a recycled sail. It's challenging but I hope it pays off in the end! sewing binding on two quilts to give away this weekend, making two pajama keepers for my biggest girls, making library bags for my nieces... um... i think that's all that's out in my craft room right now. I'm working on Easter table runners for my children and a Christmas quilt for myself! Thanks for the great pictures and recap. Sounds like a lot of fun! I am working on a wall hanging for wedding gift. The bride and grooms guest signed the fabric blocks I sent and I have printed some of their engagement picture on fabric. I can't wait to see the finished project! I just got some upholstery fabric at a thrift store. i'm about to work on a wallet from that I think. Thanks for all the pictures and the recap. I hope to go someday. Thanks for the giveaway and hope that I win!! So fun. I just finished a Tardis quilt and some bee blocks. I hope to finish the friendship bag I have in progress. I am making a t shirt quilt for my son! I am currently working on a secret quilt using hourglass blocks. Just need to decide on the backing and start quilting it all together. Deadline is in 2 weeks. 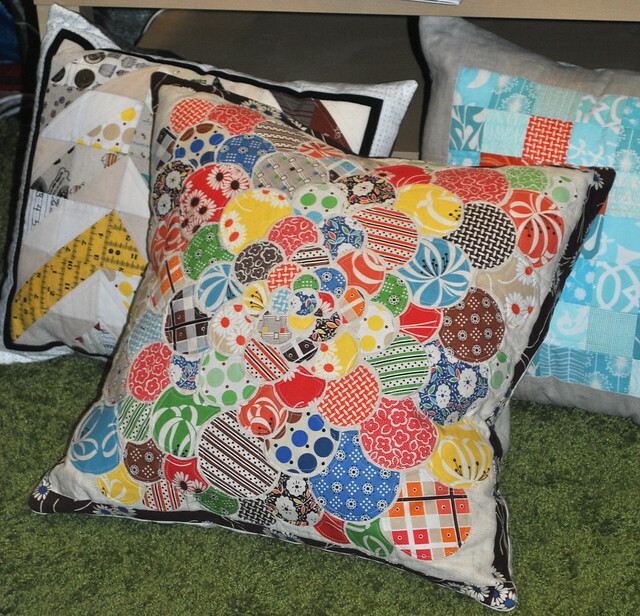 Working on some bags for a show - I really like the pillow with all the circles. I am working on finishing a quilt for my husband. His birthday is in a couple weeks. I'm working on so many things! A quilt for my daughter and a zip pouch are top of my list! I'm working on some blocks for a quilt we are putting together for one of our PHXMQG members. She's been diagnosed with breast cancer so we're making her a pink quilt. I'm working on buying more fabric-wait! I mean I am binding my Scrappy Stash February Lovely Finish happy valentines day/birthday/christmas quilt for a good friend. I'm trying to clear out a bunch of UFOs. Tonight...Project Linus quilts getting quilted and scrap vomit quilt getting added to. 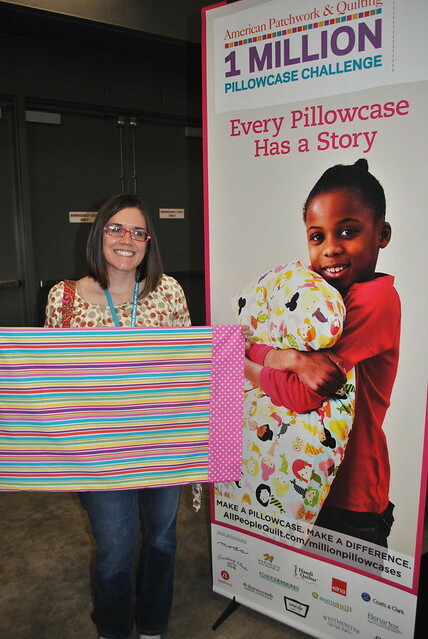 Thanks for sharing all the pics from QuiltCon. I'm working on a quilt for a great-niece. I just finished one for her brother & once hers is complete they'll go in the mail. Thanks for the chance to win. I am working on an EPP tote! I'm working on a pinwheel quilt for a baby shower & one for my son. I am piecing a back for my son's quilt and have started the shower curtain for my bathroom. Lovely pictures. This looks like such a fun time! I'm working on a wedding quilt for my best friend! I am working on a cute bunny wall hanging for my daughter and a reproduction kitty quilt for my grand daughter. Both of these quilts have been sitting around too long and I am determined to finish them! That looks like so much fun! I gotta admit, I'm a bit jealous, lol! I'm working on my daughter's bedroom quilt and accessories, and a couple of doll dresses. Finally cutting out the other 8 swoon blocks for my quilt after a year! next up for me is an ITH Zipper Wallet :-) Thanks!!! Many things, but yesterday finishing some paper pieced letters for a pillow for my daughter. I'm working on #1 A quilt called Vintage Tin for my mother. #2 A quilt hand appliqueing circles on "Bejeweled Wedding Ring" in Link to the 30s book (only 12 more arches to put circles on. and #3 collecting I spy squares for an awesome I spy quilt. Not as easy to collect as I though they would be. I'm working on quilts for my 3 kids right now. I started my first real quilt this winter and I love it. I'm figuring it out myself and making it up as I go but so far it is turning out to be a lovely quilt for our double guest bed. Already I'm planning for a quilt for my son too. It's just so much fun. I'm working on a replica of an 1880's rag doll. If I can do her justice, she will be gorgeous. I am working on blocks for an online swap I joined. I am also working on Sue Spargo's BOM. I'm working on the Fractured pattern from Displacement Activity. I am very ready to take a break from paper piecing for a bit. And oh my I covet that see through machine, great picture! I'm about to go start a qayg pouch. Pretty typical stuff for me! Lol. Plan to write a tutorial for posting on my Flickr account. 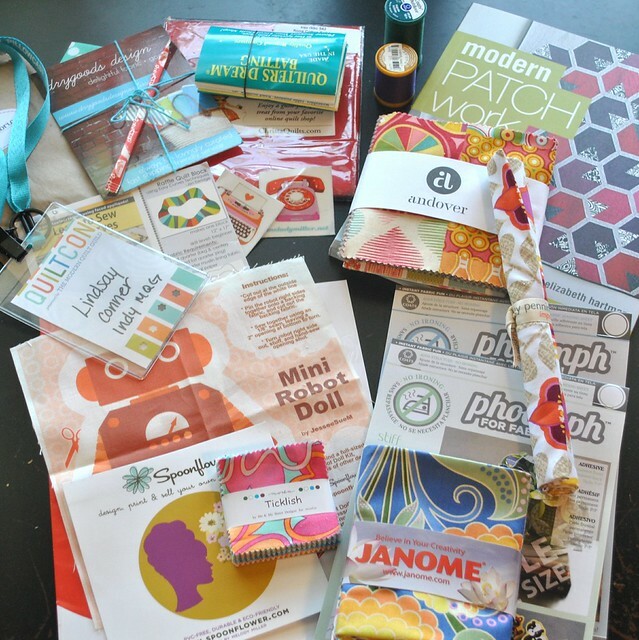 Thanks for being soooo generous with your QuiltCon loot! I'm working on a plus quilt in jewel-tones pinks, purples, and oranges. It's for my son's girlfriend. 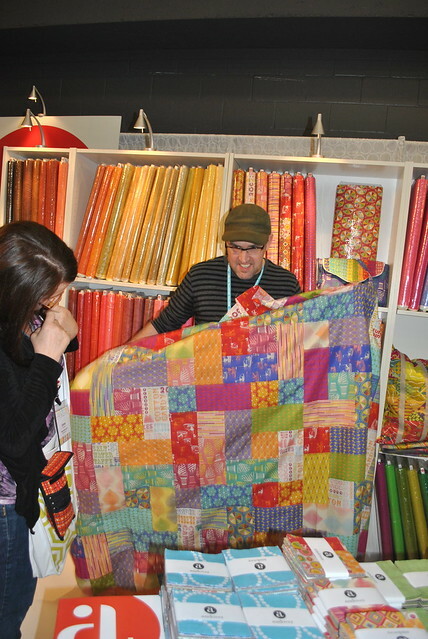 Thanks for the tour of QuiltCon and all the eye candy! And thanks for sharing your haul with a lucky someone! A costume for my little one. I'm working on a baby quilt for my daughter's first baby. I am working on some Easter clothes for some grandkids. We have 24 so part got clothes for Christmas and the rest for Easter! I'm working on a table runner for spring. I'm working on a applique quilt and starting a pieced quilt. I'm going to knit a hat next. I am working on a Dresden plate quilt, a Retro Flowers quilt and a couple of other small baby size quilts. Thanks for the great recap. Loved seeing everything. I am working on a three zip bag. And a quilt called Anthropology. And an Ispy quilt. And maybe some other stuff. I'm working on a ton of stuff. Probably too much, honestly, lol. I need to finish quilting and then trim/bind a quilt for my bed, then I have one ready to baste and quilt, two BOM in progress, and another top I just started designing, and I committed myself to making a wedding quilt for my cousin who just got married yesterday! Thanks for the chance to win! Thanks so much for sharing! I've been looking at all the Quilt Con posts. I couldn't go, but I sure appreciate people like you who share their photos! Right now i'm working on a wallhanging that has irises on it. I love purple flowers! I am working on a few things right now. I am making two bags from the Clover and Violet and trying their Embroidery 101 quilt. I am also making a new quilt out of the Morning Song fabrics from Kelly Panacci for my 11 month old daughter. She turns 1 next month. I have recently organized my (very small) fabric stash into projects and will be working my way through those as well! I would love to win some swag to help grow my stash!